As many countries modernize their banking systems, check truncation is often appearing side-by-side with UV, which demands both a visible light and an ultraviolet image to be captured simultaneously. Digital Check® makes the only devices on the market that can produce both images without any loss of scanning speed. All of our most popular models are also available with UV scanning capability. Ultraviolet security comes in all shapes and forms, from simple yes/no tests like UV fibers, to advanced features like bar codes and algorithmic serial numbers that can only be read by machines. To learn more about the types and uses of UV security around the world, see our free white paper, Ultraviolet Cheque Security: Understanding a new Era of Fraud Prevention. The CX30 revolutionized remote deposit capture when it arrived on the scene as the first inexpensive, RDC-dedicated check scanner with MICR capability. Today, it fills the same role in UV scanning, as the first single-feed, affordable device suitable for use in the bank branch or by customers in the field. UV no longer has to be an obstacle to introducing remote deposit, as the CX30 brings UV validation within the price range of finacial institutions and end users alike. 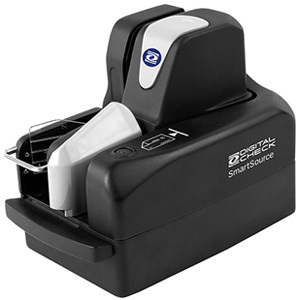 The fast and compact Elite Series scanners offer top-of-the-line UV accuracy for SmartSource users. 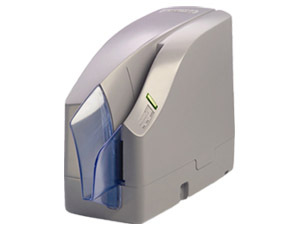 The quiet and energy-efficient device can achieve speeds of up to 155 documents per minute, with optional auto-feed and standard E13B and CMC7 MICR recognition. 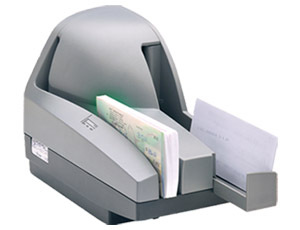 The Elite Series is also suitable for deployment at the teller window or the branch back counter. Our most popular scanner for teller capture is also the world’s most popular UV check scanner, with tens of thousands of devices deployed worldwide. Known for its exceptional durability and ease of use, the TellerScan TS240 offers one of the most affordable entry points to UV capture for those requiring a high-speed scanner.